Ernest was educated at Marlborough, at Emmanuel and Downing Colleges, Cambridge, and at St Thomas�s and St Mary�s Hospitals, qualifying M.R.C.S., L.R.C.P. in 1908. He then acted as resident medical officer to the West End Hospital for Diseases of the Nervous System. He had served in the South African war, in Bethume�s Mounted Infantry, in which he attained the rank of captain, but was invalided home after the relief of Ladysmith. He settled at Wokingham Berkshire. Ernest took up a temporary commission at the rank of Lieutenant in the R.A.M.C. on 16th September 1914. 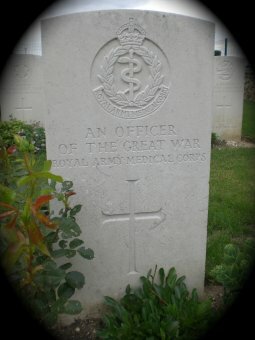 He served for three months as a surgeon at Netley Hospital and then as an acting surgeon in the Indian hospital at Bournemouth. He then went to the Front in February 1915 attached to No 8th British Field Ambulance with the Lahore Division of the Indian Expeditionary Force. Ernest was wounded by a bursting shell at Neuve Chapelle on 17th March 1915. He spent a short time in hospital at Dieppe, from which he was invalided home. He died from septicemia of the wounds. He left a widow but no children.